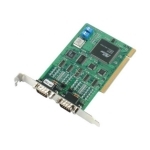 PCI or universal PCI serial expansion boards are a convenient way of expanding serial connectivity in industrial applications. Our Moxa serial cards are among the most comprehensive selections of industrial-grade solutions in the world. The serial boards come in different variants in terms of number of ports, level of isolation to any electrical interference and wide operating temperature ranges. All the boards are compatible with all the major operating systems. Excellent data throughput at over 800kbps. 4-port RS-232 smart Universal PCI serial boards. 4-port RS-232 Universal PCI boards with power over serial. 2-port RS-232/422/485 Universal PCI serial boards with optional 2 kV isolation. 4-port RS-232/422/485 Universal PCI serial boards with optional 2 kV isolation. 8-port RS-232/422/485 Universal PCI serial boards. 8-port RS-232/422/485 Universal PCI serial boards with 2 kV isolation. 2-port RS-422/485 Universal PCI serial boards with optional 2 kV isolation. 4-port RS-422/485 Universal PCI serial boards with optional 2 kV isolation. 8-port RS-232 Universal PCI serial board. 8-port RS-232 intelligent Universal PCI serial boards.